Before Zimbabwe, the Kalhari and Mozambique, there was a kingdom in South Africa called Momomotapa. It was a rich and vibrant culture, a sophisticated African Empire. Its gold artifacts are among the finest in African archaeology. Upon this land now sits a tribute to Momomotapa. It is a resort for a universally practiced game. Welcome to the Legend Golf & Safari Resort. 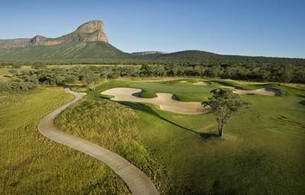 If you have come to enjoy exceptional South African views while trying your hand at the highest and longest Par 3 in the world, you have come to the right resort. Eighteen of the world's top golfers helped design the Legend's course. Padriag Harrington, Retief Goosen, Trevor Immelman and Sergio Garcia each designed a hole. This is unlike any course you have ever (or will ever) play. If you came to Legend for the golf, you'll stay for the safaris. The 22,000 hectare safari conservancy offers close-up views of the "big 5" - lions, elephants, leopards, buffalo and rhinos. Since this is a private safari, you will get a closer look of the animals in their natural surroundings. If you like to keep a busy schedule, try out the Legend's new archery field, tennis courts, or Olympic-sized swimming pool. 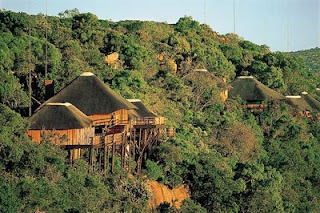 You can even take a helicopter ride over the vast African terrain or relax at the Legend Resort Spa. Your South African adventure begins as soon as you contact us!